Pepper spray has been one of the most popular products for self-defense thanks to its effectiveness, ease of use, and being legal to carry with no license or registration in most states. 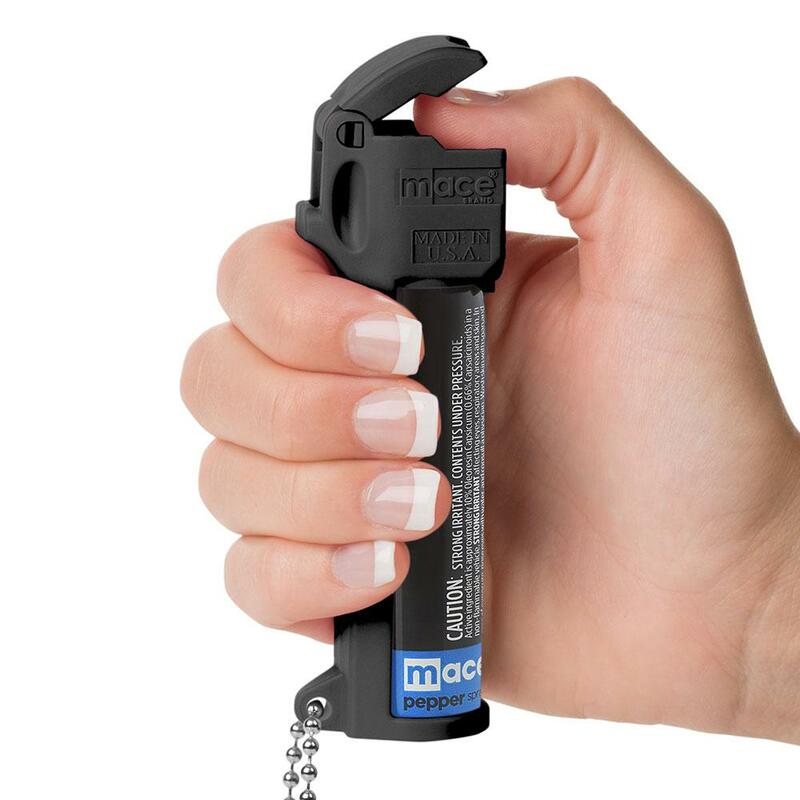 The Mace Triple Action Pepper Spray represents a step forward in self-defense technology thanks to the combination of legal, powerful chemicals designed to dissuade and disorient an attacker. There are three main ingredients to the Mace Triple Action Pepper Spray. Each one is formulated for maximum strength and effectiveness. The Mace Triple Action Pepper Spray contains the maximum strength formula of OC Pepper, which is the most potent form on the market today. In addition, this product contains CN Tear Gas which is designed to induce shortness of breath and profuse tearing which will disorient the attacker. The combination augments the power of the pepper spray to the point where it works even if you do not hit them in the face. Just spraying it on their chest is enough to cause a reaction. In addition, UV Marking Dye has been added so the attacker can be easily identified under ultraviolet light. This allows law enforcement to find, identify, and arrest the assailant if they leave the scene. This formula which combines three different chemicals allows you to stop an attacker long enough to get away and call the authorities. When sprayed, the effects of the Mace Triple Action Pepper Spray will last up to 45 minutes. 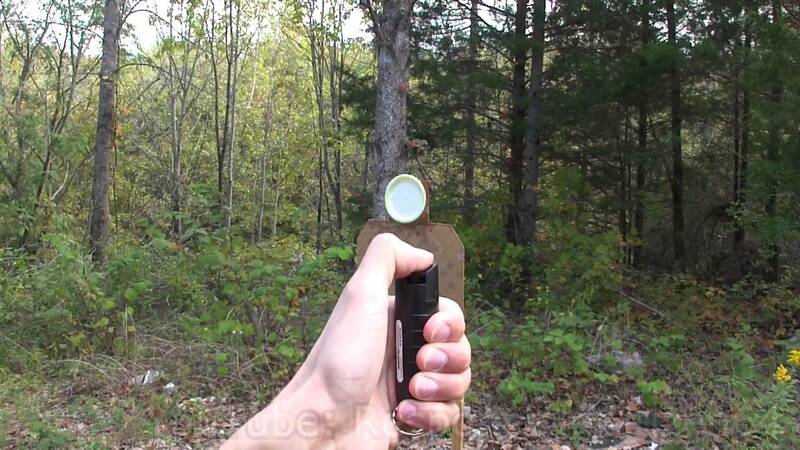 The spray comes in pocket model that holds 11 grams and sprays from 5 to 15 short bursts and strike an attacker up to 12 feet away. The pocket model comes with the famed “Flip & Grip” design which makes it easy to use so you are not fumbling around trying to spray the product. There is a safety cap that prevents an accidental discharge and the dispenser makes it easy for you to aim. It comes with a key chain so you can keep it with your car and house keys which can be pulled from your pocket or purse and used quickly when you are threatened. 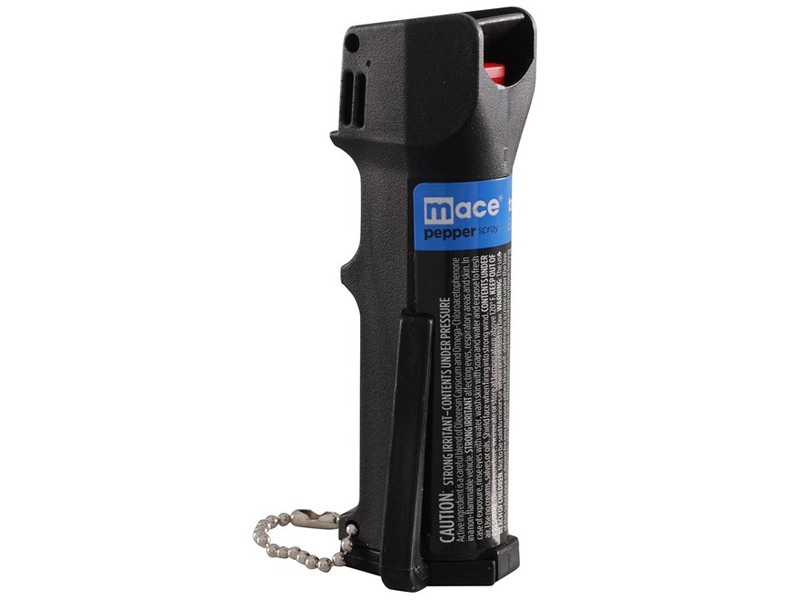 The contents of the Mace Triple Action Pepper Spray are pressurized, so do not use heat or puncture the device. For storage purposes, it should be kept in a place that provides good ventilation and within a temperature range from 32F degrees up to 120F degrees. Going below or above the recommended temperature range may cause the spray to leak or not work properly. 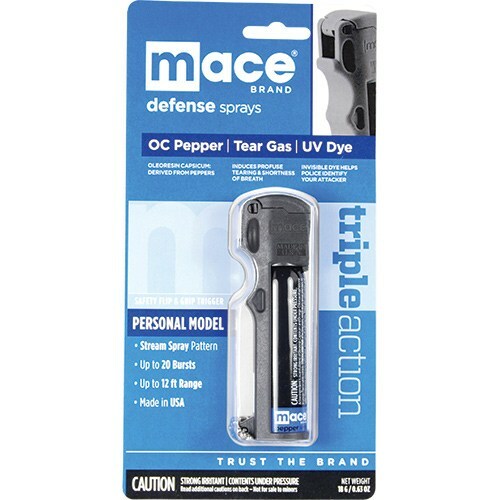 The Mace Triple Action Pepper Spray will last up to 4 years when properly stored. Each spray container comes with an expiration date and should be disposed of properly after the date has passed. This product is restricted in the states of Maryland and New York. Please check with your state and local authorities about the legality of carrying the Mace Triple Action Pepper Spray. To watch a product video click here.